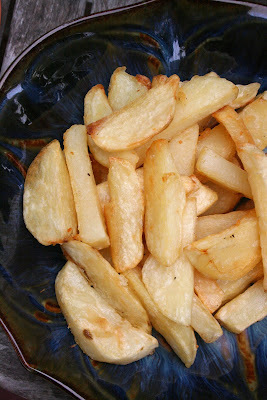 A Half Baked Life: ICLW July 2012: Do You Want Fries With That? I totally aspire to go to BlogHer some day. I would also love to have a conversation with you unencumbered by small children who need to be attended to. I hope both these things will happen. Eventually. During that month I also realized how true it is that "writing begets writing." Both times I've done NaBloPoMo I plotted out the entire month w/ potential topic ideas for each day (just in case). But I continue to be amazed how much of that plan goes by the wayside when I find myself inspired to write about other things. I wrote a post a few days ago that I had planned to schedule for over the weekend and keep bumping it up, as there are other/more important things I feel compelled to share. Anyway, I couldn't agree more about it being the voices that bring me back to my favorite bloggers. You, Mel, Lori, Jjraffe and others can write just about anything these days and you have me at the moment you press publish. It's the way you tell your stories that draw me in and move me. So thank you. As I shared in my comment on Jjraffe's post that you reference about voice, the best compliment one of my readers ever gave me was to let me know that even though she feels like we don't have a lot in common, she keeps coming back for more because she likes the way I write. Anyway, I can't wait to meet you at BlogHer one week from Thursday!!! In a short time you have become a writer/blogger that means a lot to me and I can't wait to hang out and talk with you in person in NYC! Hi from ICLW. I really enjoyed this post. And your Bust a Myth post is very powerful. Looking forward to reading more of your writing. I'm definitely enjoying reading everyone's very different takes daily: it does seem we are all in a diarist mode. Kathy, thank you for including me in such exalted company. I have really enjoyed your posts too! Great post and thanks for linking to your Bust a Myth post - so very moving. I've never had luck with baked fries but I have only ever soaked potatoes in cold water - will have to give your recipe a try. I love your tagline for your business card! I will have to try your baked fries recipe. 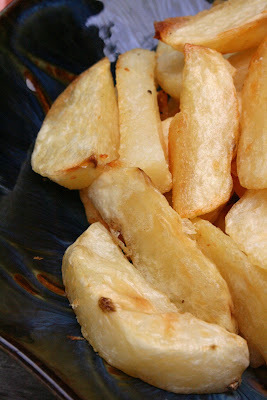 I have made roasted potatoes many times but never fries. I really enjoy reading your writing. It really is all about the voice and you have a great one! Of course you're a writer! It made me sad to see how your education shriveled your passion for a while. But a writer can't be silenced, and your voice is lovely and unique. Thanks for sharing. As a linguistics major, I too was asked what in the world I'd do with what I'd learned. If you don't plan on being a Linguistics professor, or working at Google, there isn't much out there for our kind. Then again I became a language teacher so I ended up using a lot of what I learned, and it was fascinating stuff anyway, I never really cared much if I used it, I just loved to learn it! Here from ICLW :) I remember writing stories in school! And at home...I still have a couple boxes full of stories I wrote as a kid. I'm sure they'd be laughable if I read them now! But at the time we truly felt like "real" authors, didn't we? Ah, good times. You're right - if you write, you're a writer. If you paint, you're a painter. I think when people worry about readers too much they start to morph into some sort of advertising executive. I'm licking my computer screen trying to taste those fries, just fyi. You are a writer, my friend. Every post that you've written is beautiful and thoughtful. I look forward to reading everything that you write.